Ethiopian swimmer Robel Kiros Habte totally deserved to be in the Olympics. Robel Kiros Habte of Ethiopia competes in a men’s 100-meter freestyle heat at the Rio 2016 Olympic Games on Tuesday. One year ago, nearly to the day, Ethiopian swimmer Robel Kiros Habte plunged into the pool in a preliminary heat of the 100-meter freestyle at the world championships in Russia. By the time he stopped swimming—1 minute, 4.41 seconds later—Habte had clocked the 115th best time of the 115 swimmers in the competition. What happened? “The last 50 meters was much too hard for me,” Habte said at the time. Undaunted, he vowed to improve. “I want to be famous,” he said. Robel Kiros Habte got his wish. 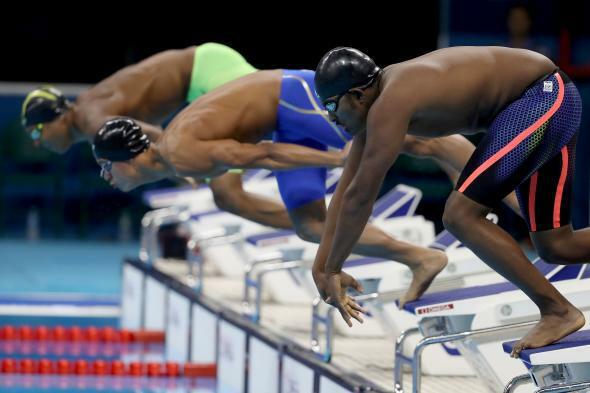 The 24-year-old swimmer, one of 59 swimmers to compete in the 100-meter freestyle on Tuesday, finished last in his three-man heat, in which he was pitted against a swimmer from the Ivory Coast and the Dominican Republic. Habte swam like his bathing suit had lead in it, losing length after length until he was 12 seconds behind the other swimmers and off the TV screen altogether. His time of 1 minute, 4.95 seconds clocked in last of the 59 entrants in Rio. He was the only swimmer not to break the one-minute mark. He was also an instant viral sensation. “I am so happy because it is my first competition in the Olympics,” the Ethiopian told Reuters. “It didn’t matter where I finished.” Well, it kind of did matter. Footage of Habte’s race ricocheted around social media, as did pictures of Habte’s, shall we say, less than svelte physique. Standing 5-foot-9 and weighing in at 178 pounds, complete with Dad Bod paunch, Habte looked more like those of us who watch the Olympics than those who actively participate. Some corners of the internet have fretted that Habte’s body is being shamed; the Ethiopian has been christened “Robel the Whale,” which is indeed quite cruel. But there is no denying the reality that Habte has neither the body nor the talent of a top-flight Olympic swimmer. According to Reuters, Habte was competing in Rio thanks to a “special invitation from world body FINA extended to athletes from under-represented countries.” Why would Habte be invited to Rio rather than some other Ethiopian swimmer? Well, his father is reportedly the president of Ethiopia’s swimming federation. Habte’s performance wasn’t just poor by the standards of the Rio Games. He would have also finished last in the 2008 Beijing Olympics and the 2012 London Games. His time is also several seconds slower than the 10-year-old-and-under records for both American girls and American boys. In fact, about 15 percent of 11- and 12–year-old boys who compete under the USA Swimming banner have clocked times faster than the Ethiopian Olympian’s. But that doesn’t necessarily mean that Habte shouldn’t have been in Rio. His time in the 100-meter freestyle on Tuesday is just a few seconds slower than the Ethiopian national record. And Habte himself holds the national record in the 50-meter freestyle. FINA’s rules state that “under-represented countries” can invite one male and one female swimmer to the Olympics. (Ethiopia’s female entrant, Rahel Fseha Gebresilassie, will swim on Friday.) Perhaps there’s a more qualified swimmer in Ethiopia. But it seems just as likely that Robel Kiros Habte was his country’s hope for Olympics swimming glory.